Caps have been a symbol of both academic and sporting success for many years, a practice started in the late 1800's and carried on through tradition today. As early as the 15th.C Academics in Europe used to wear caps during study, a practice eventually duplicated by countless schools. A Graduation Cap is a permanent memento of your hard work and commitment, a display of your transition from learner to learned. It's your special moment, an earned rite of passage and your Graduation Cap represents a significant personal achievement. 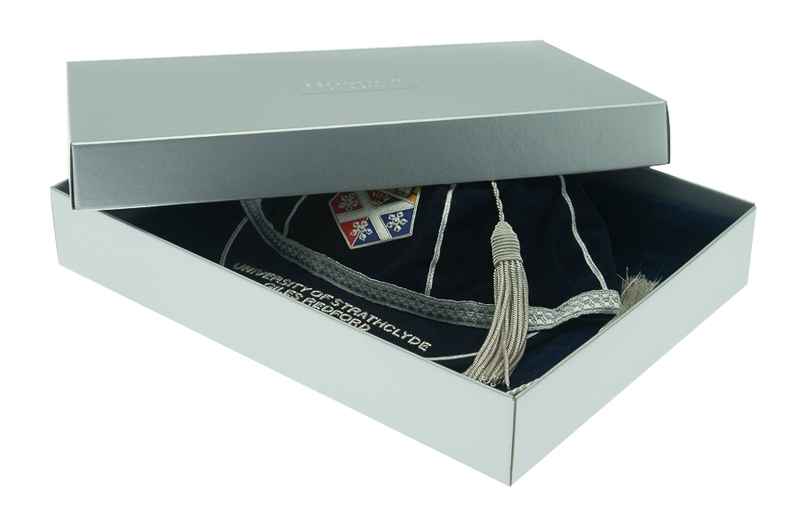 Our family proudly maintain the tradition and produce bespoke Graduation Caps in conjunction with a range of classic finish presentation and display options. The six-panel caps are produced in a selection of 21 colours in stunning Japanese Felt, if required, you can choose a separate colour for each of the six panels and a separate colour for the lip. The lip of the cap is also covered in felt which neatly covers both sides. The 'Trim' of each cap comprises of; the decorative brocade around the rim; the panel seams; the braid on the outer edge of the lip; the tassel and finally the button that sits on the crown. The trim comes in a choice of Gold or Silver braid and you can choose certain options of the trim to be included or left out completely. The seam braid,lip braid, rim brocade and tassel can be included in five combinations, please see the Cap Designer page for visual details. (Further colours of trim are available for orders of 20 caps and above, contact us for more details). We are very proud to produce the finest handcrafted caps and we mark each one on the inner lining with our personal details. Depending on the text or logo your cap text is produced in either cotton embroidery, wire finish or a combination of both. This part is subject to our design teams recommendations although if you have a preference you can contact us for further advice. The normal structure of the text is to have the name or logo of the university on the front of the cap above the lip. On the lip, you can put your name, qualification and date of achievement although what and where you put things is your choice, you are the designer. Graduation Caps generally look fine in one colour although we have produced them in 2-3 relevant colours and they look great. The front panel should usually match the colour on the cap lip. All parts of the trim selected together are the preferred, more traditional look. Text in CAPITALS looks best. To start designing your cap please go to the Cap Designer page. 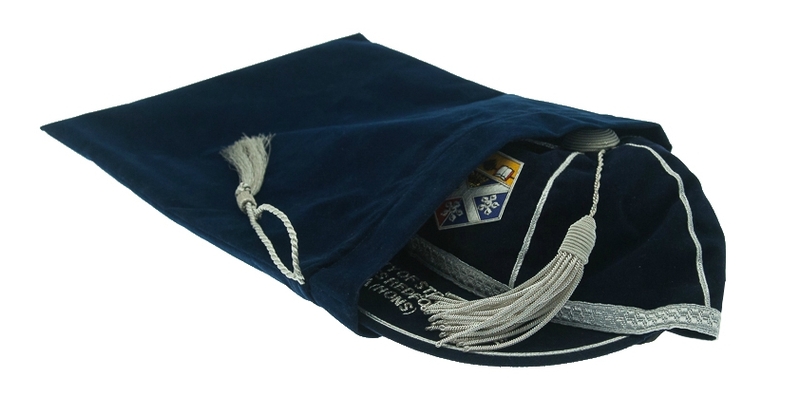 We supply Graduation Caps purely for ornamental purposes as they are not designed as a wearable garment. The focus of the cap is for striking decoration and they present beautifully as gifts. 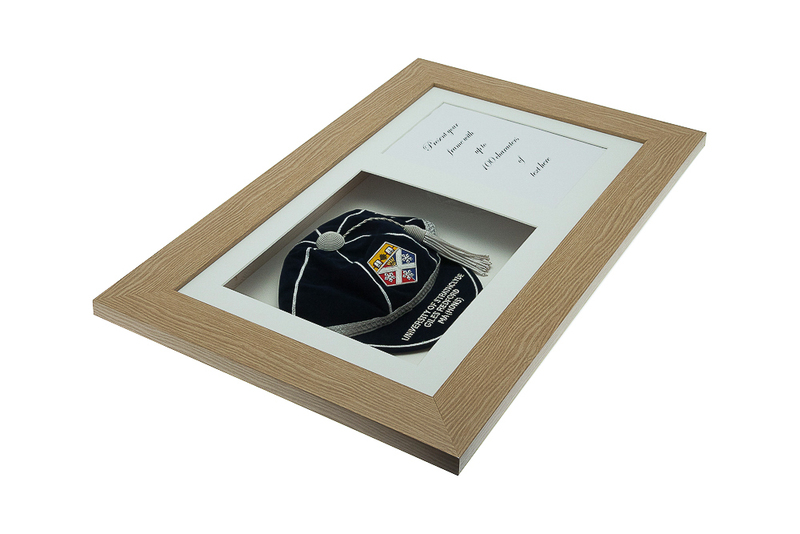 The Caps are available as single items to purchase or you have a choice of presentation methods for the cap, we can frame it, present it in a luxury box or preserve the cap within a velvet pouch. To see the full range of display and presentation methods please go to the accessories page. Typically a handmade cap can be with you to a UK address within 4-6 weeks for free delivery or 2-4 weeks if you choose express delivery at the checkout . Please check the website if you require international postage by visiting our Delivery Information page. If you would like to start designing your Graduation Cap please go to the Cap Designer page.